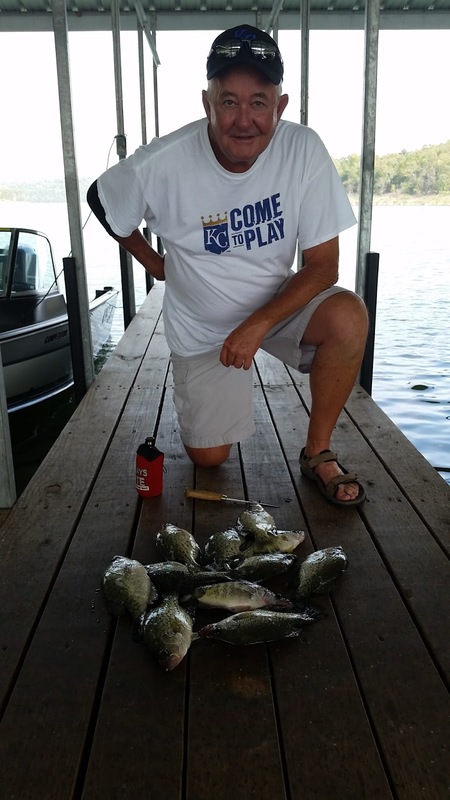 Crappie and bass are biting exceptionally well on Norfork Lake at this time. The last month has been one of the best crappie bites I have seen in quite a while. 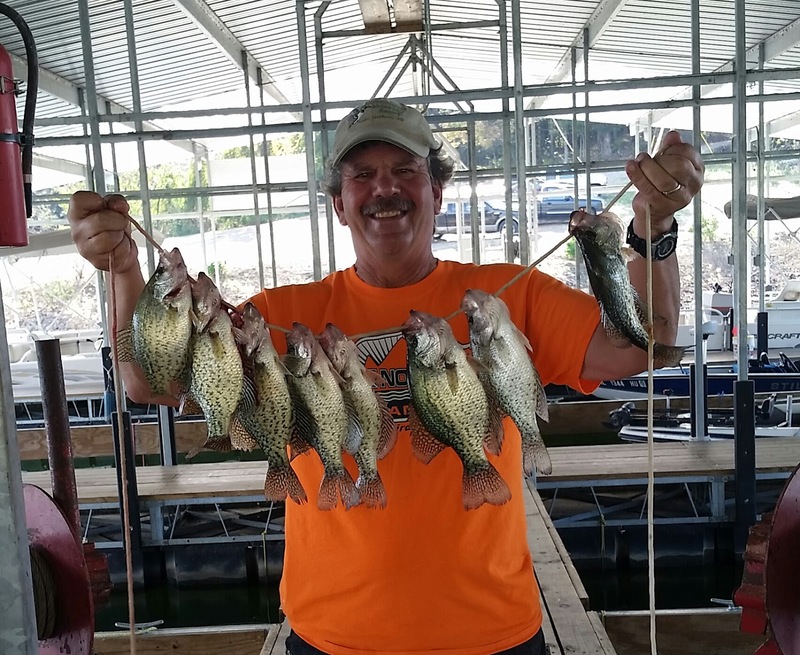 The crappie have schooled on sunken brush and are at all depths, depending on the depth of the brush. I have a couple of sunken trees where I have been fishing that has branches that are only 10 feet under the surface, and other brush piles are coming up to about 20 feet. Most of the time I am catching the crappie on the top of the brush no matter of the depth. I have been jigging a 1/4 ounce spoon (white with a green back), but others are jigging with a hair jig or little grubs with a twister or paddle tail. Live crappie minnows with a slip float are also working really well. I am catching very few short crappie, but the majority of the fish are just in the 10 - 12 inch range. 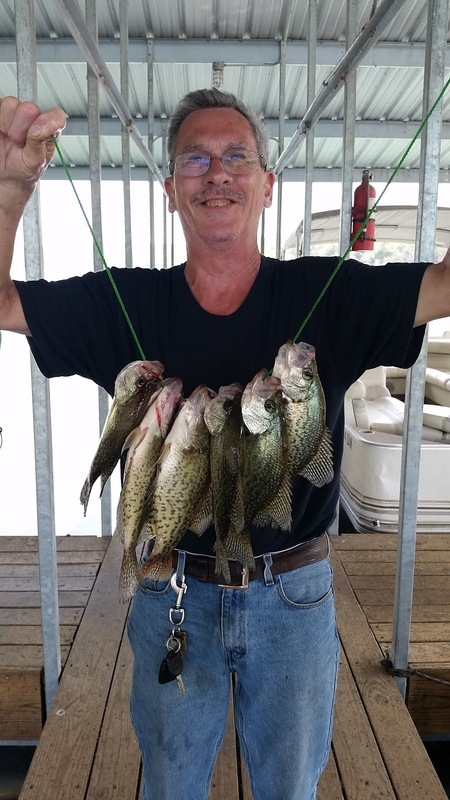 One of my guests did land a nice 14 inch crappie last weekend. 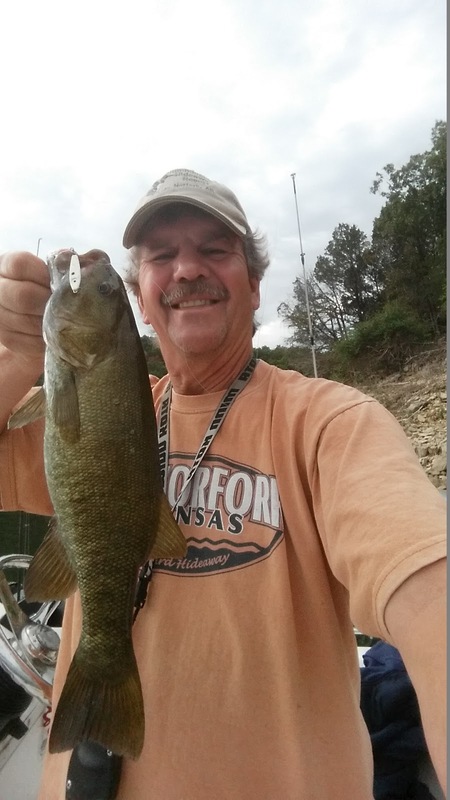 Largemouth, smallmouth and spotted bass are starting on their fall feed. They are feeding on small minnows as well as crawdads. This morning I was vertical jigging with a spoon along a bluff line in 20 - 30 feet of water and ran across a small school of smallmouth bass laying on the bottom. I marked the fish with my depth finder and then they starting attacking my small 1/4 spoon. I ended up landing three very nice smallies, they sure are a lot of fun to battle on a light weight rod with 6 pound test. I also landed several other small largemouth bass in the same type of area. One of my guests this morning, for a hour, caught largemouth and spotted bass in 30 - 32 feet of water on a large flat area. His fish were feeding on crawdads. He was vertical jigging with a 1/2 ounce spoon. 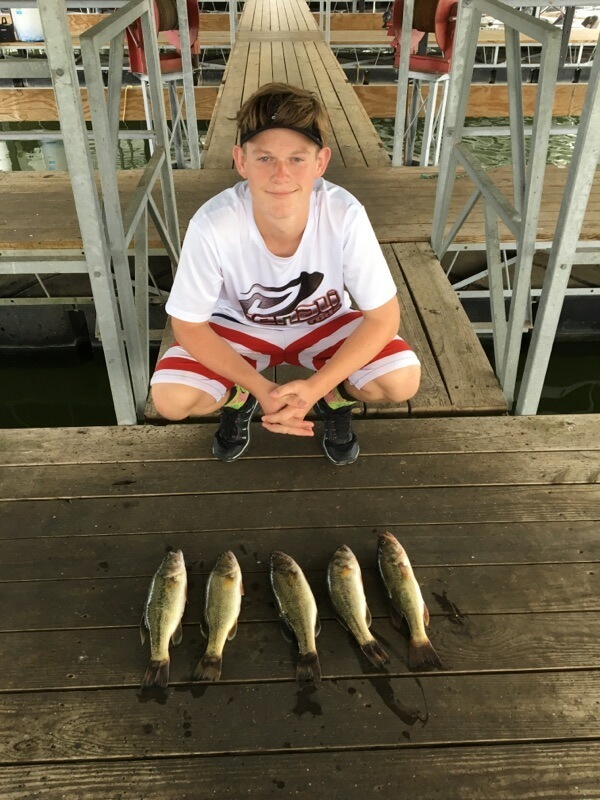 Last week I had a family out bass fishing, their son had lots and lots of fun landing many bass. His best bait was a Texas rigged worm worked along a bluff line. 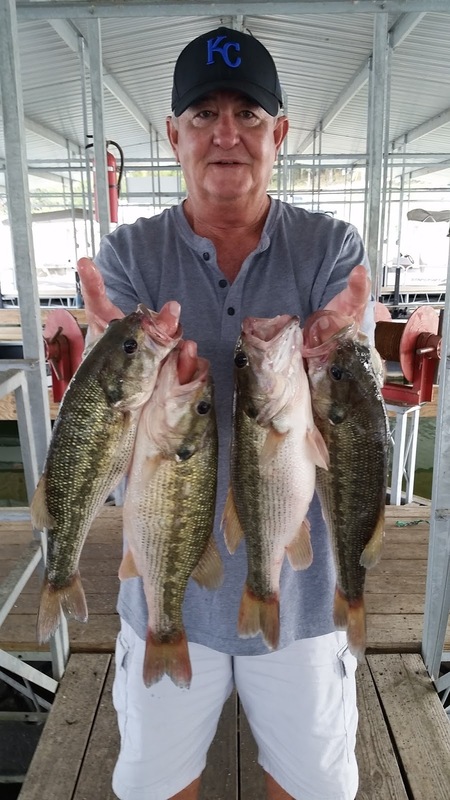 His fish were coming out of 15 - 25 feet of water and most on the bottom. Striped bass fishing is still off, at least for me, but with the upcoming cooler weather, I believe we will see some activity in this species over the next couple of weeks. I did get into some feeding hybrids last Friday in 18 feet of water several hours before sunrise. The striped bass are still scattered though out the lake waiting for a water temperature that makes them feel good. The surface water temperature is holding around 76 degrees in the early morning and rises a few degrees with the heat of the day. Cooler weather is on its way so we should start seeing a steady fall in water temperature over the next week. The lake level has reached normal pool and generators are being run sporadically to maintain this level. 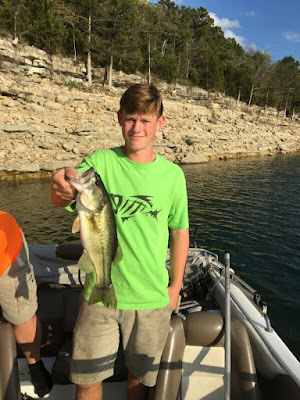 The stabilization of the lake should help improve the bite for all species. The creeks and coves are stained and the main lake appears to be clearing to clear.